Summer - 6:00 a.m. to 10:00 p.m.
Winter - 8:00 a.m. to 5:00 p.m.
Ice has melted off of the reservoir. The boat dock and fishing dock are not yet available. Campground and day use flush restrooms have been winterized. Vault restrooms are available. There is construction in the campground with the restroom building being replaced. Construction should be complete by mid April. Campsites are available, but several are closed due to the construction. Additional Fishing Info: Wildlife Resources recently planted 26,000 8″ rainbow trout. Campground Conditions: Campground restrooms have been winterized for the season, vault restrooms are available. Winter camping rates are in effect. Hyrum Reservoir was created in 1935 by the construction of an earth-fill dam. 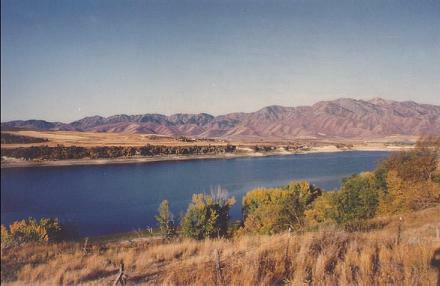 The reservoir shoreline	is owned by the State of Utah with mostly unrestricted public access, although fees are charged in improved recreation areas. Hyrum State Park's facilities are located on the northern shore, and include 31 RV campsites, restrooms, showers, a ranger station, boat ramp, dock, and trailheads. Fish Hyrum from the shore or a boat. Standard trout bait such as Powerbait should work from shore, or try trolling from a boat using crankbaits or spinners. Fish with worms for panfish or catfish. Check out the Hyrum Reservoir Dam camera for current conditions.